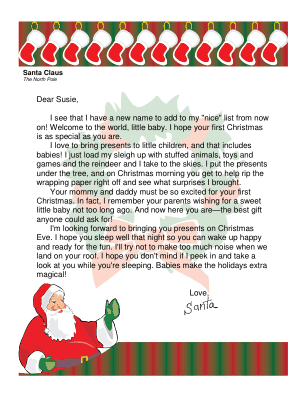 Baby's first Christmas is a special time that can be commemorated with this printable letter from Santa that mentions the excitement of his or her parents and promises to bring presents on Christmas Eve. I see that I have a new name to add to my "nice" list from now on! Welcome to the world, little baby. I hope your first Christmas is as special as you are. I love to bring presents to little children, and that includes babies! I just load my sleigh up with stuffed animals, toys and games and the reindeer and I take to the skies. I put the presents under the tree, and on Christmas morning you get to help rip the wrapping paper right off and see what surprises I brought. Your mommy and daddy must be so excited for your first Christmas. In fact, I remember your parents wishing for a sweet little baby not too long ago. And now here you are-the best gift anyone could ask for! I'm looking forward to bringing you presents on Christmas Eve. I hope you sleep well that night so you can wake up happy and ready for the fun. I'll try not to make too much noise when we land on your roof. I hope you don't mind if I peek in and take a look at you while you're sleeping. Babies make the holidays extra magical!